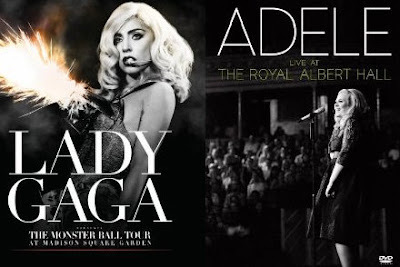 Courtesy of Fly Life, this week's Swag Tuesday prize is a double diva DVD package of concert films from gay icons Lady Gaga and Adele, both of which are available today online and at music/video retailers nationwide. Live At The Royal Albert Hall was recorded on September 22 at the height of what has been an amazing year for Adele. Available on DVD and Blu-ray, "Live At The Royal Albert Hall" features the full 90 minute concert performance, plus special behind the scenes footage shot throughout the day leading up to the concert. The package also includes an exclusive live CD of the entire show. This is the first time all of Adele's hits and best loved songs will be on one CD plus her stunning covers of Bonnie Raitt's "If I Can't Make You Love Me" and The Steeldrivers "If It Hadn't Been For Love"
Multi-platinum and Grammy Award-winning artist Lady Gaga will release a Blu-Ray & DVD copy of the critically acclaimed, Emmy Award winning HBO special Lady Gaga Presents The Monster Ball Tour at Madison Square Garden that includes exclusive, never before seen footage. Also being released is the album Born This Way The Remix – a 14 track collection of remixes by some of today’s most prominent artists, DJs and producers, including TBD and TBD. The new products are also available in a special package called Born This Way The Collection, that will include the multi-platinum 17-track record Born This Way, the brand new Born This Way The Remix album and the Monster Ball Tour DVD. Enter to win the double diva DVD package by commenting on this post. Only enter once and please remember to include your email address in the text of your comment. Entries close at midnight on Thursday, west coast time. Publicists: If you'd like to take part in Swag Tuesday on JMG, please email me.